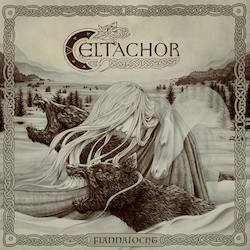 Darkened Celtic folk metallers Celtachor from Dublin, Ireland have just revealed the first details of their upcoming third full-length album, called “Fiannaíocht“. It is the first chapter about Finn of the Fianna: his youth and training with the druid Finegas in the forests of Ireland, the killing of Aillen, the fire breathing terror of the Tuatha dé Danann, the capture of the Cauldron of Plenty, amongst many other of his great feats for the Fianna. He is one of Irish mythologies’ greatest heroes, and there are many more of his tales to tell… This is just the beginning. Celtachor have unveiled the beautiful album cover by Anaïs Chareyre Art. The artwork represents Finn of the Fianna, with his hounds Bran and Sceolang, in the desperate search for Sadhbh, who was changed into a doe by the dark Druid Fear Doirche of the Men of Dea. More news and release date will be announced soon!